The latest free update for Doom brings in AI opponents, a new multiplayer mode, Snap Map tweaks, and apparently, even a change to the game's DRM. 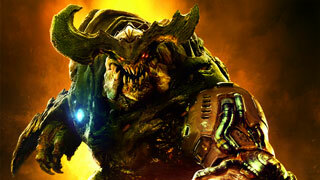 Yesterday, id Software rolled out the latest free update for Doom. Titled "Free Update 5," it brings a number of new features to the game, including one that might have been slipped in under the radar. First up is the addition of multiplayer bots. These AI opponents will be handy in helping you learn the maps and strategies you need in multiplayer, without requiring you to get your brains beat in playing against more experienced online players. There are a few limitations, as the bots can only be used in Deathmatch and Team Deathmatch modes, and only on the maps that shipped with the game at launch. The update also includes "Infernal Run," a new multiplayer mode that challenges players to take control of a "ball" that looks like an eyeball and carry it to the opponent's goal and score it. Finally, it also raises the highest multiplayer rank to Echelon 11. Once you reach that rank, you'll be rewarded with the signature Doom Marine Armor (Praetor Suit). Also included in the free update are a number of changes to SnapMap. These include the Doom Marine in Praetor Suit Armor, a number of new Lazarus lab-themed modules and props, a new first-person camera entity, single-player interactive objects, and more. To celebrate, there's a double XP event going on now that runs through 12 PM ET on December 12. Shortly after that, on December 15, the third and final paid DLC for Doom - Bloodfall - will launch. You can find all the info on the new update over at Bethesda.net.. But there's one thing you won't find mentioned there: the removal of the game's Denuvo DRM. According to a thread on NeoGAF, this patch removes the Denuvo DRM from the game. If you aren't familiar with Denuvo, it's basically anti-tampering software that stops pirates from cracking the game. It also has the unfortunate side effect of preventing most mods from being created as well. We've reached out to Bethesda to see if they can confirm the removal of the DRM, and what that might mean for the future of mods. We'll update this post with any response that we receive.